On a chilly drizzling Saturday morning in March, Adelaide Food Central was invited to Gathered Design Market (Gathered SA) at The Queens Theatre. It was perfect market weather to enjoy food, drink, stalls, workshops and live music from South Australian makers and creators. Shop for a range of gifts and treats including homewares, candles, flowers, jewellery, art, clothing, skincare and more while supporting locals. As expected, we spent a lot of time checking out the food and drink area of Gathered SA. With acoustic music provided by Nathan Hansen Music, we savoured delicious food and drink ranging from Vietnamese, burgers, curries and arancini to waffles, sweet treats, coffee, wine and gin. Dietary requirements like dairy free, gluten free and vegan/vegetarian were catered for. Many can’t start the day without a good coffee and the Public is used to serving corporate hustlers their first brew of the day at their Franklin street location. Their portable coffee stall is pleasantly waking up market-goers at Gathered SA. Thank you to barista Sam for the great latte! Food truck and caterers Gang Gang set up their cart at Gathered SA to sling quality burgers. 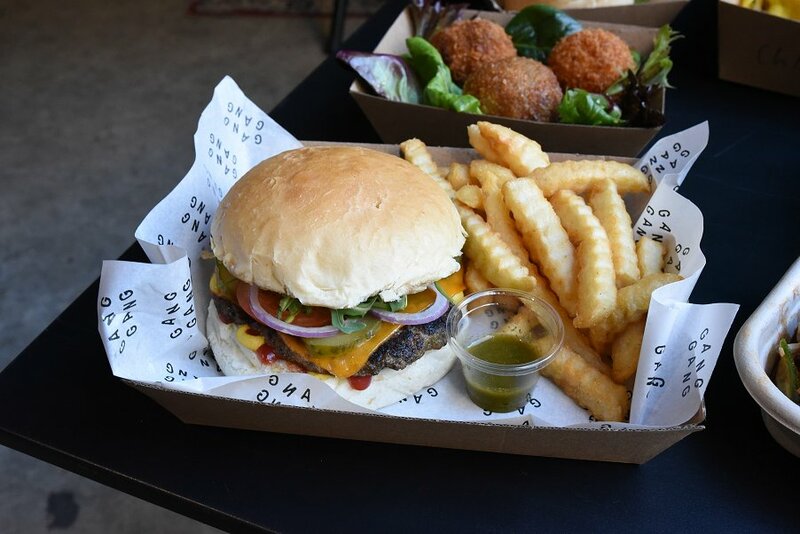 I tried the Vegan Cheeseburger with deceptively vegan cheese and a mushroom, walnut and white bean patty that concerned me for a moment that I had grabbed a beef burger. Served up with crinkle cut chips and goey mozzarella sticks. Regulars on the market food scene, you can find Gang Gang at similar markets or catering at wineries. Mobile food stall Mời Ăn Viet Street Food provide easy bites while you’re browsing the market stalls or heartier meals to sit down and enjoy the ambiance. 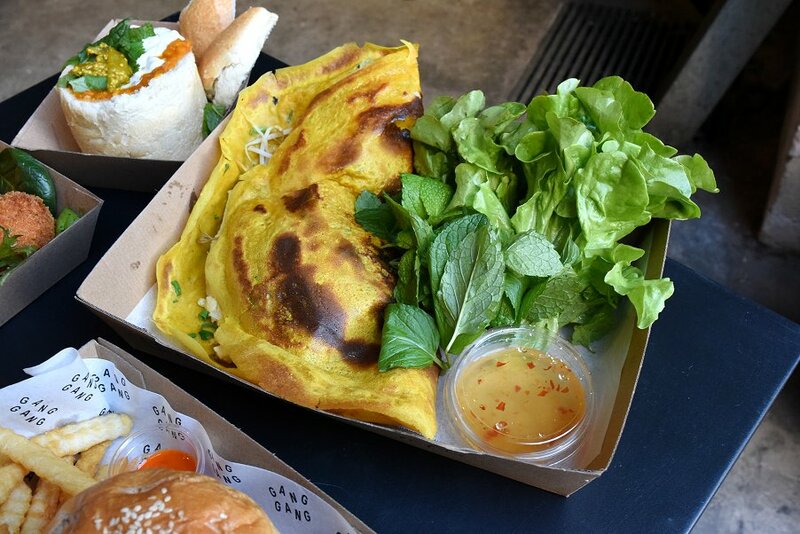 We tried the Bánh Xèo – a savoury pancake – and chicken satay. The satay made with chicken breast had a beautiful crunch and tasty peanut sauce while the Bánh Xèo with tofu was soft and fluffy with crisp fillings. You can see how they make the sizzling Bánh Xèo on their socials @moi.an.adl. The awesome people at Grasso have been busy the last 2 years popping up at markets, festivals, events and their Monday-to-Friday jobs! 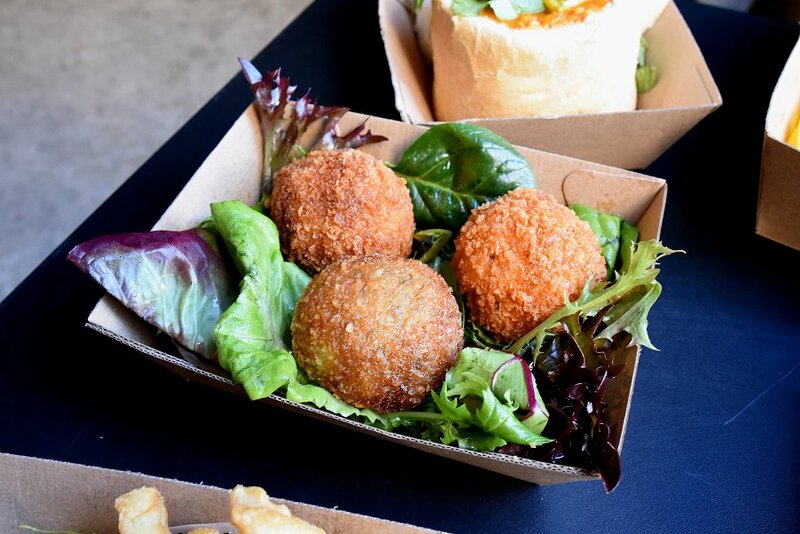 Making arancini out of their parent’s kitchen, the team keep rollin’ (by hand!) out beautiful crunchy balls. We tried the trio of mushroom, pumpkin and capsicum. For cheesy fans, make pumpkin your favourite as it oozed mozzarella from opening and when combined with sage butter the flavour of the roast pumpkin was softened. Find Grasso at Nutella Palooza for something extra special. 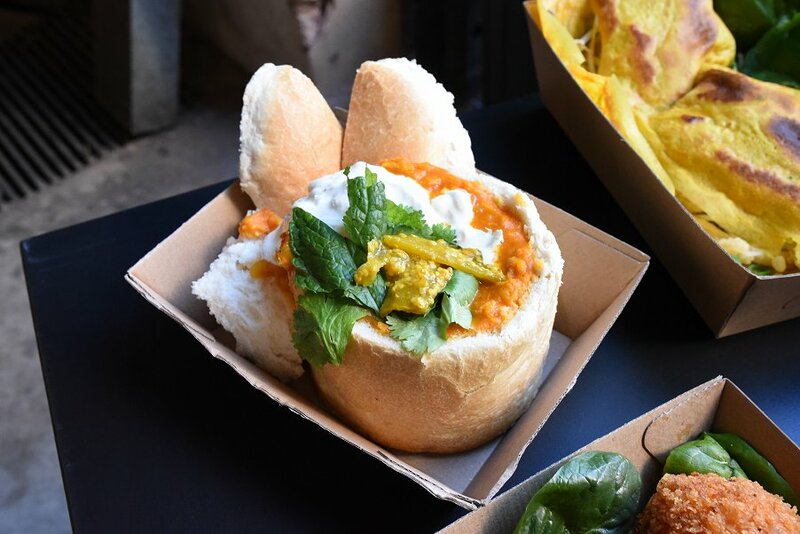 Bunnychownow served up fragrant South African curries in custom made bread rolls. Owner Krystal started making her curries out of the pub she worked at before moving them over to her own business with help from her 4 sons. Based in the Barossa, Bunnychownow caters at markets, events and private functions. It is their third time at Gathered SA and I’ll be sure to track them down again to re-experience their South African street food. 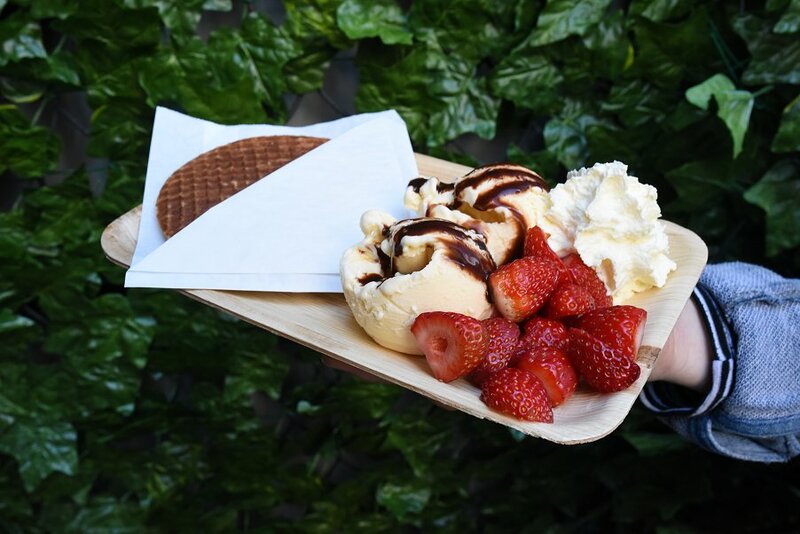 After filling up on savoury items, our dessert stomachs made room for some Dutch stroopwafels courtesy of TaCHs Stroopwafels. For the uninitiated, stroopwafels are two thin waffles held together with caramel syrup. Have them with cream, ice-cream and strawberries if you feel like treating yourself (and can handle the dairy). Hither & Yon were showcasing their best wines and look at Gathered SA. Their stall gave a snippet into what their cellar door looks like with dried flowers and art hangings delicately placed around the bottles. The beautiful bottle labels were designed by independent artists around the world who create the labels based on the tasting notes of each wine. Apart of the McLaren Vale region, enjoy a glass (or bottle) of the 2017 Cabarnet Sauvignon by their fireplace at High Street Willunga. Gathered SA provided more opportunities to sip wine courtesy of XO Wine Co. and Pure Vision Wines. Another wonderful McLaren Vale winemaker, XO Wine Co. produce wines that are approachable, easy drinking for all occasions. Family owned Pure Vision Wines create organic, vegan-friendly wines – get cosy and enjoy one their reds. And for those who prefer liquor to wine, Carter’s Coffee Liqueur provided espresso martinis. The intense coffee liqueur is subdued with vanilla, chocolate and citrus characters. Carter’s Original Coffee Liqueur is brought to you by the Applewood Distillery at Gumeracha. Thank you Jenna and the wonderful food and drink vendors at Gathered SA for chatting to us and letting us sample your work. Experience the wholesome vibe for yourself and check out amazing South Australian creators and makers at their next event. Follow @gatheredsa on Instagram for more information. The next Gathered Design Market will be held on July 13 and 14 at The Queens Theatre.